CHENNAI. 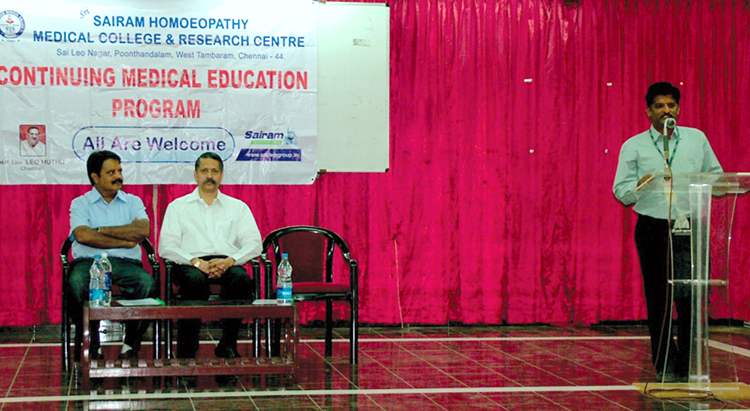 DEC.23: Shree Sairam Homoeopathy Medical College, Chennai organized a CME at their Auditorium on 23thDecember 2011.Dr.Cheramannan, Principal of the college welcomed the Guest speakers and gathering. Dr.R.Gnanasambandam presented an Audio Visual presentation on “Constitution and Miasm” and Dr.P.V.Venkatraman made his presentation on “Management of Acute Diseases”. Prizes and certificates were distributed to the over all university rank holders by the Guests. Sel.Sathya and Sel Deivanai anchored the event and Sel.Sudharsana proposed vote of thanks.